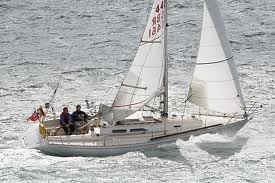 A big thumbs up to skipper George cox and Anthony for the safe delivery of a contessa 32 to Plymouth. Thumbs up had the call to deliver this yacht last minute and luckily one of our principle skippers George was free to step up and take the job. From initial contact to handover was only 48hours! After leaving Lymington on a fine day George and Anthony arrived well within the delivery date and having fuel problems sailed onto a mooring buoy in Torpoint. After the clean up, rig check and snag list the yacht was handed over in time and left in great condition well done guys!